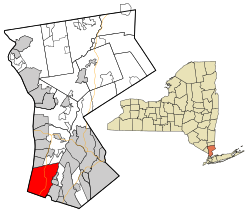 Yonkers borders the New York City borough of The Bronx and is 2 miles (3 km) north of Manhattan. Broadway runs through all three, and railroads also connect them to Grand Central Terminal. The Bronx River separates Yonkers from Mount Vernon, New York on the east. The Hudson River is on the west. The city's best-known attraction is Yonkers Raceway, a harness racing track. There is a large shopping area along Central Park Avenue. It is sometimes called "Central Avenue" by area residents. ↑ "2016 U.S. Gazetteer Files". United States Census Bureau. Retrieved July 5, 2017. This page was last changed on 17 June 2018, at 01:43.